When it comes to hiring for quality, less is actually more. Let me prove it with a rather radical proposal that starts with the premise that you only need 15-20 passive candidates to make one great hire. The key to success with this idea is that you need to carefully select the 15-20 people on your target list, persist and talk with at least 75% of them, and then convince them you’ll give them a 30% increase. However, to muck things up a bit, the 30% increase is non-monetary. To muck things up even more your hiring manager has to agree to NOT use the traditional skills and competency-laden job description as part of the selection criteria. Accepting this concept requires a change in the paradigm underlying the sourcing process used at most companies today. This is pictured in the graphic. It subdivides the talent market into three sub-groups. People in the top tier are represented by the upper segment. The teardrop represents the typical mix of people who apply to posted jobs or follow a company. This includes a few highly qualified people, many somewhat qualified people and a large group of unqualified people. 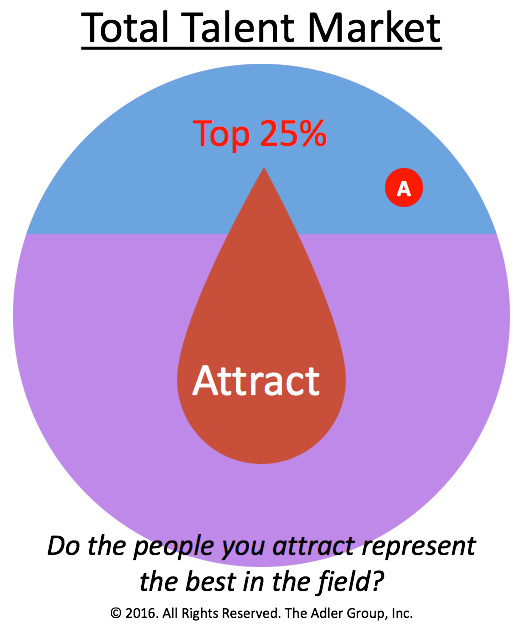 The small “A” circle represents the 15-20 prospects you’ve identified on LinkedIn who are in the top 25% and would consider your opening a career move. 1. Define the context of the job by preparing a performance-based job description. Every job can be described as a series of 6-8 performance objectives, like, “Upgrade the financial reporting system to track daily operating performance.” This is better than saying, “Must have a Big 4 CPA, 5+ years of manufacturing experience and an MBA.” A performance-based job description is the baseline for demonstrating the job represents a 30% increase. 2. Develop a short list of high potential prospects. LinkedIn Recruiter is a great tool for finding local, high-achieving candidates who have slightly less experience than typical for the job. By combining Achiever terms (awards, great schools, strong companies, special recognition, etc.) with LinkedIn Recruiter’s powerful search filters, it’s not hard to develop this list in a few hours. By proactively searching on your co-workers’ connections you can get more prequalified A-team referrals. 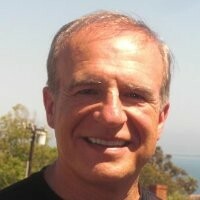 These types of referrals should comprise about half of your short list of prospects. 4. Shoot for a 75% campaign response rate. This is a critical make/break objective. Since you’re only working with a few pre-selected prospects, you need to engage with most of them. This requires a series of emails and voice mails combined with an extra dose of persistence. The goal is relatively easy to achieve, though, if many of the people have been referred. 5. Use consultative recruiting to determine the possibility of a 30% increase. When you get the prospect on the phone, don’t pitch your job. Instead present the purpose of your call as an exploratory discussion about a possible career move. While you’re reviewing the person’s LinkedIn profile, look for at least a 30% difference between your opening and what the person has accomplished. To get to 30% you’ll need a combination of job stretch (bigger job), more impact, faster job growth and a mix of more satisfying work. 6. Recruiting is not selling the job; it’s getting the candidate to sell you. Your objective with each person you contact on your target list is to determine if the job you’re trying to fill represents a true career move or not. If so, explain the possible components of the 30% non-monetary increase. As part of this, suggest the job might be too big a job and test this by asking the person to describe some challenging stretch project. If you’ve set up the situation properly, the person will excitedly tell you what she/he has accomplished and why the job you’re representing could be interesting. This is how you get candidates to sell you - by first selling themselves on the career merits of your opening. When it comes to recruiting for quality, less is more. The idea is to spend more time recruiting a very short list of pre-selected prospects. Done properly, quality of hire will increase along with improved performance, reduced turnover and increased job satisfaction. That’s hiring from Z to A.